There are trees blooming in our neighborhood – in February! Further down the street, there’s a rosebush in full bloom. Here in southern Texas for our first winter, these blooms are two months ahead of what is usual for us. I don’t feel like we deserve this. We haven’t earned it. When we lived in the north, I saw the springtime flowering as a reward for having survived the difficult winter. This year, once again, winter has unleashed its fury upon Michigan and the north. As I write they’re trapped in a swath of snow that spreads across two thousand miles. There are two feet of snow already blanketing the earth, and more is expected. Life has come to an icy halt, and even the mail is delayed. Last fall, as the winter approached in Michigan, I could feel it in my bones. This winter was going to be hard. In the core of my body I was constantly aware of a knot of fear. I felt terrorized by winter’s approach. Winter is rough on the body, especially if you have an autoimmune disease. Having lived through many difficult winters in our Great Lakes surrounded peninsula, my body sensed what was coming and braced itself. Squirrels and other creatures also knew. They scurried about getting ready. Then we were relocated and were handed a reprieve. We would not have to live through that harsh climate for another winter. This is a picture of grace. God’s grace grants us a reprieve, something we could never earn, something we don’t deserve. And yet he offers it freely. Grace wafts soft in the warm breeze and blooms in the gardens. Here on the Gulf of Mexico, a few weeks down in the thirties comprise a hard winter. Twice the temperatures dipped into the twenties, unusual for here, and it snowed. There was ice. It paralyzed the city. This weather made us feel more at home. We hear that this winter’s overcast sky only happens during bad winters. Yet the gray sky comforted us. We felt as if we were in a familiar place. The Michigan mitten is perpetually cloudy in the winter, since it’s also surrounded by water on three sides. Yet another gift of grace, another way that God made us feel cherished in our new home. 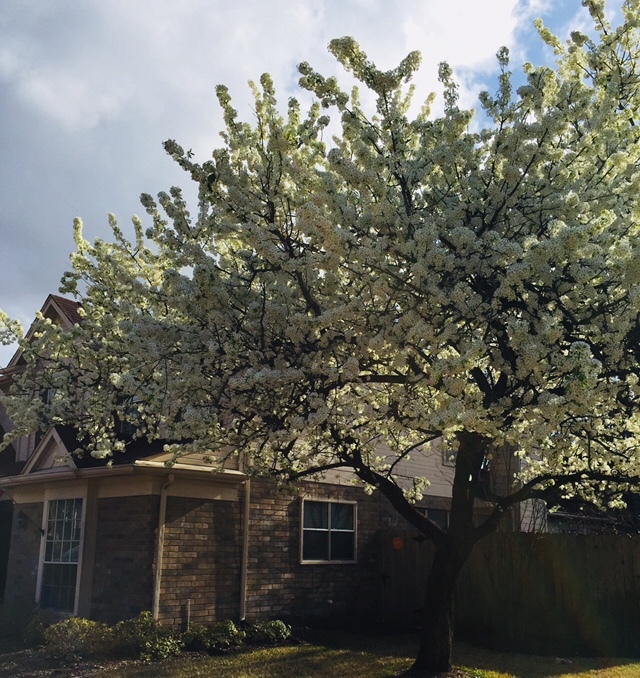 So when we saw the blooms in our neighborhood and listened to the thunderstorm and the falling rain last night – in February, I felt such joy in my heart. This is undeserved mercy. God is good to us, in both big ways and small, and I stop today to thank him for this gift of a mild winter with a quick end. This grace reminds me of the coming final reprieve and relocation to a far, far better place where pain, hardship, and bitter cold will never touch us again. Melinda, I loved reading your reaction to our winters. It made me think of my own reaction. I long for spring. This past week, when I felt I could not take the cold another minute, the Lord blessed me with sunshine and temperatures in the high 70s. Ahh. Yes, my friend, we do feel in our bones. Needing some warmth. Thankful for the coming spring. Thank you! Are you a Texan, Gail!